Charming Lake Leelanau Cottage! This 1950’s home offers 150 feet of private direct frontage on South Lake Leelanau with desirable sunset views, 3 bedrooms, 1 bath, and plenty of room for expansion! 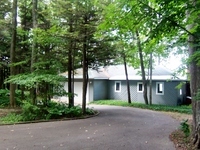 A 273 sq ft guest cottage offers extra room on this deep parcel located in central Leelanau County! Fantastic turn-key vacation rental property only minutes from Leland, Suttons Bay, & Omena and only a short drive to downtown Traverse City & Glen Arbor / Sleeping Bear Dunes!